The students on campus generally want to take the state flag down, but the outside community staged counter-protests. Thank you DAILY MISSISSIPPIAN for the image. Conquerors? Really? That’s funny. I recall my Yankee ancestors conquering yours in the battles where that flag in your hands was waved unanachronistically. And Black lives do matter. So do the protests of black students, who have every right, while trodding on ground where men like Mr. Winkler threatened to shed James Meredith’s blood fifty years ago for having the audacity to enroll there, to feel that the last contemporary bastion of institutional racism’s symbolism is embodied in the Mississippi State Flag, the last flag in the Union still emblazoned with the Confederate symbol. Mr. Winkler gave the impression in his interview and in his choice of tattoo of not having a college education. He and the counter-protesters came from other places, no doubt from under Tallahatchie river rocks next to newts and insects, to protest the removal of a flag from a place that wouldn’t have let his conquering blood matriculate because of low test scores. Certainly Mr. Winkler flunked history, at least. But Mr. Winkler needn’t have protested if his objective in doing so was to keep a Confederate heritage alive at The University of Mississippi. Indeed, the history of the college is such that it can hardly be doubted that it will retain its past symbols of conquered Confederates. And while I abhor the politics of racism, I think the Left enters dangerous and anti-intellectual territory where it wishes to deface monuments longstanding to racist regimes, for if we do not remember the past, we are doomed to repeat it. It is the contemporary symbols, like the contemporary flag, which must go — but it would be nearly impossible to imagine that the University of Mississippi could divide itself from the Confederacy in history, even if it wanted to. This is a monument to the Confederate Dead on the Ole Miss Campus. 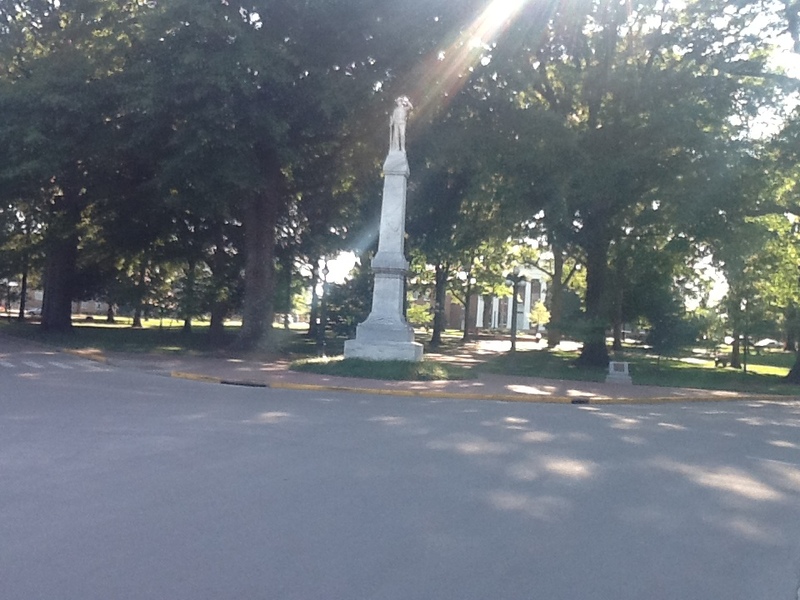 When one enters the campus of Ole Miss from University Avenue, headed toward the administration building, one passes a monument to the Confederate dead. Indeed, if seen in a vacuum, the story of the deaths of students at Ole Miss at the Battle of Shiloh and elsewhere are tragic — entire graduating classes perished in grey uniforms under fire from the Union army. Next to the Confederate monument is a building that was used as a hospital for the dying Confederacy. In it, one sees a stained-glass monument of the high-melodramatic style of the late Victorian era. If one enters the campus from Highway 6, and one looks for parking away from the football stadium, which is often restricted, one may park behind the basketball stadium, where a cemetery for those soldiers who died in the hospital building on campus got buried. 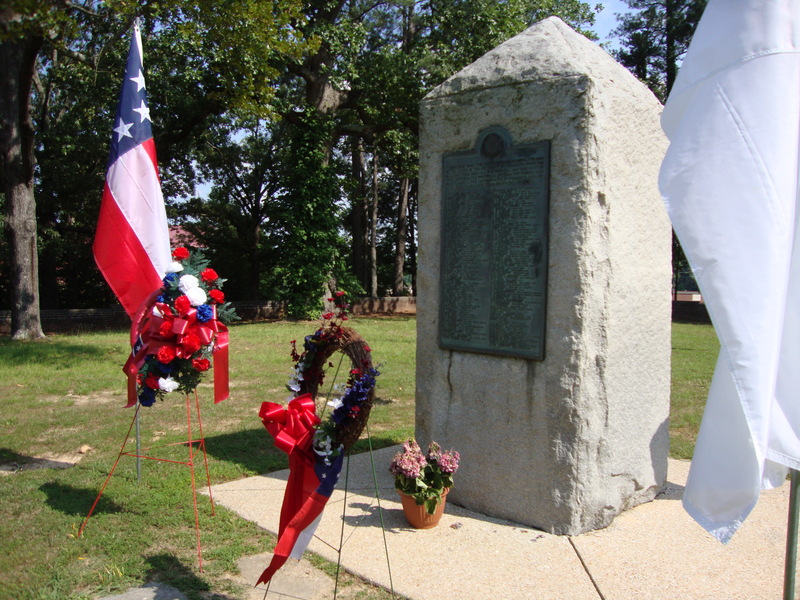 On Confederacy memorial days, women of this era show up in hoop skirts, and men in grey reenactment uniforms arrive, and they place wreaths here for unknown soldiers of their conquered cause. Mississippi ought to stop insulting the African-American descendants of slaves with the symbol that was used to oppress them during the war, then terrify them in the hands of Klan terrorists after the Civil War was over and the Yankees had packed up and moved back North. Nobody deserves to go to school in an environment where some ignorant idiot would actually tell them that their lives didn’t matter. The truth of those monuments — that the boys who enrolled in 1861, white and privileged, arrogant and swaggering, the sons of slave-owners, who all got Gatling-gunned down and got buried here and there where swamp animals didn’t devour their corpses — the truth of the sad melodrama of a society that knew it had been conquered, those things ought not be removed. I wouldn’t mind, though, seeing a monument somewhere on campus to the people who died in Mississippi from the rigors of plantation life in dirty shacks, with insufficient food, backs scarred from whippings. My instinct would be to put it right next to that Confederate soldier statue, though it would ruin the symmetry of the rotunda. My instinct would be to make it at least as large as the nineteenth-century monument, and why? Because black lives do matter. Confederates did not conquer. And those privileged white boys, their lives were extinguished to defend an indefensible institution, one that brutalized the many for the pleasures of a few. This is literally where the Confederate bodies are buried on the Ole Miss Campus. But I would tear nothing down. 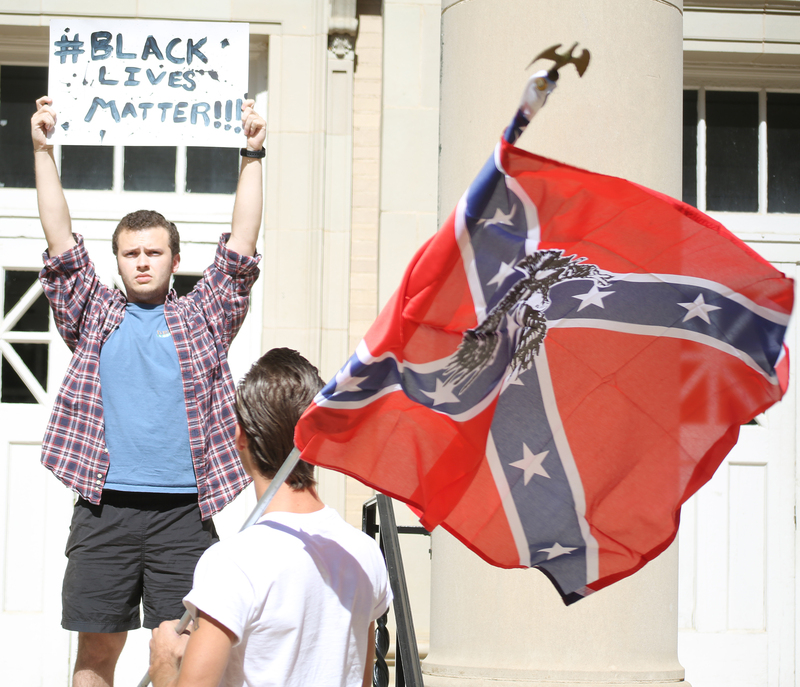 The ghosts of Confederate soldiers will continue to haunt Ole Miss, especially on nights like the night of November 6, 2012, where a young man got filmed for Youtube, naked all but for an American flag diapering his frat-boy bottom, drunk in the flatbed of a friend’s trunk, angry because Obama won again, shouting “F#ck the N%ggers!” over and over again, just yards away from that Confederate Soldier statue, the true son in the political spirit and overbloated privilege of a small class of white men in Mississippi over the hardworking aspirations of people of color who did him no wrong and over even Mr. Winkler, who needs a real history lesson, as he assumes the cause of that spoiled rich boy somehow reflects his own interests, when in fact it does not. If he were not so defined by his hatred, literally scarred with swastikas of his own selection, I would call him a victim here. I think he has been horribly conned. I would tell him he should clamor for something that acknowledges the total and wasteful loss of white lives in the service of an elitist Confederacy which held the lives of his ancestors at an even lower price than the lives of the slaves they owned and might exploit in peace time. There is blood on the campus of Ole Miss, but it is not the blood of conquerors. There is dried blood of wasted lives. And there is new blood of hopeful members of the New South, and they want to take down a flag that insults the humanity of many students there and the intelligence of absolutely anyone. We don’t believe in myths any more. We want to explore the truth in greater clarity. We want our lives, all our lives, to matter, to be spent in pursuit of worthy causes, ones that serve our interests collectively and individually. Take that accursed flag down!